In this new story over at the Panam Post that Zero Hedge picked up on their website on Saturday, the story shines a very bright light on two of the biggest problems they're facing in Venezuela that help to explain why conditions are now so dire there. Sociologist Tomas Paez argues that the disastrous socialist public policy of Chavez and Maduro has been the primary factor in the massive exodus from Venezuela. The story then goes on to hit straight to home for everybody in America who thinks that we'll be better off with socialism here, especially to those university professors who've been pushing 'liberal policies of mass destruction'. Reporting that the salary of the average university professor in Venezuela is between 5 and 7 dollars.....and if you're waiting to gasp to learn that they only make $5 to $7 an hour, you'd be terribly wrong, the average university professor in Venezuela brings home between $5 and $7... A MONTH! Anybody still ready for socialism in America? 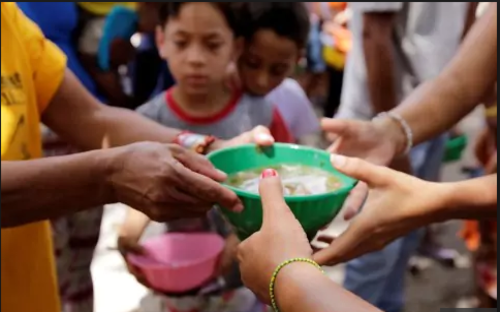 While the cost of living in Venezuela is 57.18% lower than we have here in the United States and rent in Venezuela is 81.14% lower than what it is in United States according to Numbeo, at least 87% of the people in Venezuela now live in poverty. 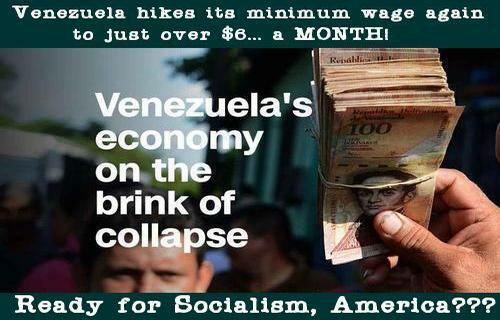 And even with the much lower cost of living and rents in Venezuela, imagine trying to survive off of even $50 a month. While Numbeo's figures for the average Venezuelan monthly salary of $33.36 differs from the figures given by the Panam Post and even a recent CNN story as we see below, Numbeo also reports the average 1 bedroom apartment rents for $182.22 per month outside of the city center while basic utilities run about $12.29 a month. And while gasoline there sells for 1 cent per gallon according to the global petrol prices website, a meal for two at a mid-range restaurant averages about $30 leading us to ask, how can the people of Venezuela even survive in that socialist nation? In fact, according to the Panam Post story, should the average university professor in Venezuela choose to leave the country like millions of others have already done with an estimated 3 million Venezuelans leaving over the past several years, and they choose to leave Venezuela by plane, they'd have to work between 15 to 18 years, non-stop without spending money on anything else, just to get the money they'd need to buy the plane ticket. "Long live Venezuela, hurrah?" As CNN itself reported earlier in March in this story saved over at Archive, while those in Venezuela who are earning 'minimum wage' recently saw President Nicolas Maduro raise it to what amounts to $6.13 a month using current exchange rates, due to the country's runaway inflation rates, that amount is far less than they were making last year. And last year, the average person in Venezula lost 25 pounds. That amount was up from the 18 pounds that the average Venezuelan lost in 2016. Still ready for socialism, kids? As we've reported time and again on ANP, what has been happening all across Venezuela should be looked at as a very dire warning to America. Is anybody listening? And with the 'mass exodus from Venezuela' mirroring what we're now seeing from the state of California with that socialist-wannabe-nation sinking into collapse with tens of thousands homeless as Mary Taylor recently reported on ANP, it's easy to see that anybody who's pushing us into socialism is pushing us towards complete destruction. With zookeepers allowing zoo animals to battle it out in a 'lose and be-eaten' nightmarish dysphoria and the people of Venezuela selling their selves or their children to acquire their next meals, criminal gangs there are using food to lure children in as new members while starvation becomes the 'new norm' there as we hear in the heartbreaking 1st video below. As CNN also reported back on January 17th in a story titled "You Can't Get $1 Out Of The Bank In Venezuela. I Tried", their reporter Stephano Pozzebon who lives there had recently spent 4 hours visiting 4 different banks in a vain attempt to withdraw money - his net result: 6 cents! While most Americans could dig around on the floors of their cars and find at least 5 times that amount of change without looking too hard, there but for the Amazing Grace of God go we. Yet how close might America be to reaching 'Venezuela-levels' of depths of despair within our own country? While the 'purchase power parity' of Americans in 2016 was $57,300, the forecast PPP for Americans in 2025 is only $11,304. Let's compare that to Venezuela. While Venezuela's 2016 PPP was $15,100, (MORE than the PPP for America is forecast to be in 2025! ), the forecast PPP for 2025 Venezuela is only $9,720. Purchasing power parity is an economic theory that compares different countries' currencies through a market "basket of goods" approach. According to this concept, two currencies are in equilibrium or at par when a market basket of goods (taking into account the exchange rate) is priced the same in both countries. While the PPP for the US in 2016 was almost 4X that of Venezuela, our forecast PPP for 2025 is not even $2,000 above the PPP being forecast for Venezuela showing us once again, the 'deep state' who Deagel gets their information from is 'forecasting' America in total collapse by 2025. 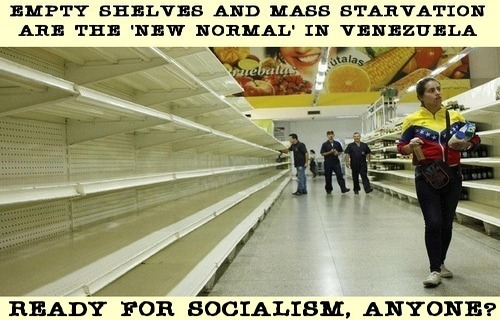 With empty store shelves and mass starvation the 'new norm' in Venezuela and clueless Americans still pushing socialism as 'the answer' to the problems here in our own country that ail us, we remind you that all throughout history, food has been used as a weapon by totalitarian government's against their people, just as we're witnessing now in Venezuela. And while we should be ever grateful here in America, where our grocery store shelves are stocked full every day and our next meals as close as our refrigerator's, it's been warned over and over again that Venezuela should be looked at as a warning to America, even if our country never falls to the catastrophic levels of poverty being seen there. 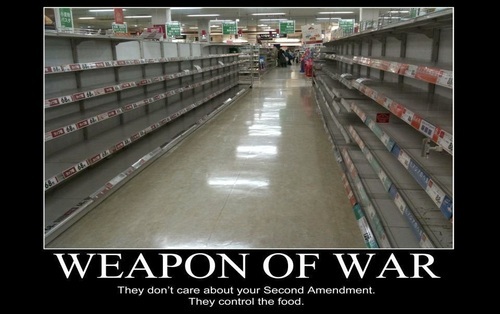 For should war break out upon US soil or an EMP take down our electrical grid, past snow storms across big cities in America show how quickly store shelves are cleared out, especially if in the future people suddenly came to realize that what they saw upon the shelves before them might be the last time they saw food in grocery stores for a very long time. With most people in America still completely unprepared for a TEOTWAWKI situation suddenly happening here and the clueless masses pushing for socialism with a majority of millenials preferring to live in a communist, socialist or fascist country according to this Washington Times story, people should really be careful about what they wish for, they just might get it.